Carpets are stretched at the time of installation and attached to a tack strip to hold the stretched carpet in place. 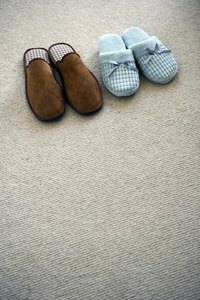 Carpets will usually stay stretched for several years. Over time, however, the carpet may come loose from the tack strip, causing lumps or ripples to appear in the carpet. To repair the carpet, you need to restretch the carpet using a knee kicker and then trim the excess carpeting from the room to keep the carpet looking pristine. Grip the edge of the carpet with a pair of pliers, and pull the carpet up from the tack strip. Place the knee kicker teeth into the carpet near the stretch. Hit the knee kicker with your knee to stretch the carpet toward the wall. Continue kicking until the carpet is stretched to the wall, and then stick the carpet back down on the tack strip. Move back to the rippled area, and start a second stretching pass. Fan out to the left and right on subsequent passes to stretch the carpet. Cut the carpet to the wall using a carpet cutter. Gently hit the carpet with a rubber mallet to attach it to the tack strips.